The Meteorological Agency said Sunday it has raised the volcanic alert level for Mount Shirane near Gunma and Nagano prefectures from Level 1 to Level 2 to ban entry to areas near the crater. Since Saturday evening, volcanic earthquakes at the Yugama crater have been on the rise, accompanied by slight crustal movement signaling higher eruption risk, the agency said. Large ash deposits might also emerge within 1 km of the crater, it warned. 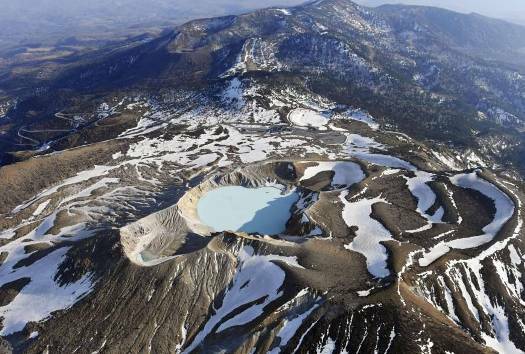 Mount Shirane is part a cluster of volcanoes in the two prefectures that is collectively called Mount Kusatsu-Shirane. After the announcement, the Gunma Prefectural Government closed an 8.5-km stretch of Route 292, a scenic national road connecting the two prefectures. The so-called Shiga-Kusatsu road is used by many people traveling to the nearby Kusatsu hot springs resort. Local tourism officials are concerned its closure could discourage tourists from visiting the popular resort, particularly during Golden Week, the string of public holidays lasting from the end of April to early May. “It’s regrettable right ahead of Golden Week . . . but we need to keep monitoring the situation for a certain period of time,” Kusatsu Mayor Nobutada Kuroiwa said. In January, Mount Motoshirane, another volcano in the Kusatsu-Shirane chain to the south of Mount Shirane, erupted, killing one person and injuring 11 others. The Level 2 warning for Mount Motoshirane remains unchanged, the agency said.